We are so blessed by our church’s program for preschoolers. There are at least half a dozen teen helpers in the class, meaning my son gets plenty of one-on-one encouragement and help. This week when I picked him up from class he was super excited to show me his What Makes Me Special craft. 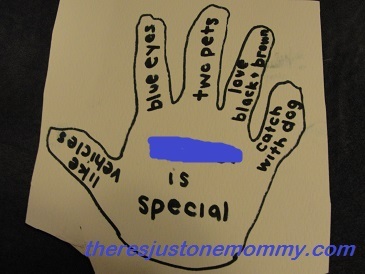 Want to make some of your own hand prints to show how special your kids are? The first step is to trace their hands. I think it would be fun to use one of their favorite colors either for the paper or for the marker you use. The next step is to write “their name” is special in the middle of the hand print. On each finger you will write something that makes them special. You can jot down what color eyes or hair they have, how many pets or siblings they have, their favorite things to play, or maybe a favorite book or cartoon. A collection of this What Makes Me Special craft would make a beautiful bulletin board in a preschool classroom. We have ours hanging in the kitchen, where everyone can see it. I’m so glad your son is still enjoying himself. What a marvelous idea. I don’t think just children should do this craft. I think everyone should. I’ll certainly be making mine today and hanging it where I can see it. In our world where fake perfection is promoted, we all need to remember we are special. Beautifully said! I love the idea of everyone making one….Maybe it should be a family project this week!